Still in search of last-minute holiday gifts for your bookish family members and friends? We’ve got you covered. 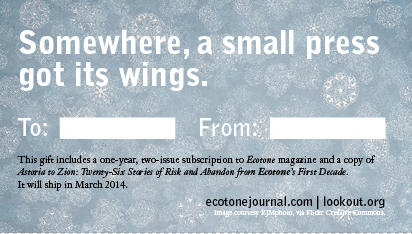 When you purchase a one-year, two-issue subscription to Ecotone, we’ll throw in a copy of our forthcoming best of Ecotone fiction anthology, Astoria to Zion: Twenty-Six Stories of Risk and Abandon from Ecotone’s First Decade. The total for this three-title package? Just $25! The two-issue subscription—normally $16.95—will begin with issue 16, which is devoted to the theme of migration—work that engages a broad sense of motion, memory, journeys, and movement in thought. Among many others, it features Jim Shepard, Angela Carter, Molly Antopol, Cary Holladay, Hailey Leithauser, and Luis Alberto Urrea. 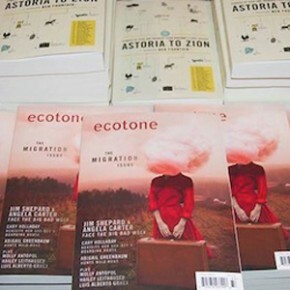 Both the migration issue and Astoria to Zion—$18.95 retail—will arrive in early 2014 in a single package, and the next issue of Ecotone will arrive in fall 2014. It’s the gift that keeps on giving! Place your order today, and we’ll even email you a set of PDF-writable gift cards you can send to the lucky recipient, just in time for the holidays. Anthology contributors include Steve Almond, Rick Bass, Ron Rash, Edith Pearlman, and Brad Watson, as well as important emerging voices Lauren Groff, Ben Stroud, and Kevin Wilson. Place your order today, because this offer won’t last long!